2003 remastered reissue of 1971 album includes three bonus tracks, 'Your Move' (Single Version), 'Starship Trooper - Life Seeker' (Single Version), & 'Clap' (Studio Version). Elektra/Rhino. I'm not a big fan of Yes, but I've enjoyed some of their music enough to seek it out. My biggest criticism of them -- one I don't hear much -- is that their music often uses its complexity in the wrong way. Complexity can make music intriguing, or it can just jerk the listener around; Yes' music does the latter too much for its own good. 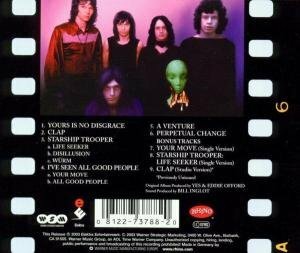 As for THE YES ALBUM: It's worth getting for "Starship Trooper," "I've Seen All Good People," and "Yours Is No Disgrace," in roughly that order. Of the rest, "Clap" doesn't make much difference one way or the other; "A Venture" is weak and awkward but also brief. "Perpetual Change" is frustrating because it takes two song ideas that are each good in their own way and crams them together in a way that doesn't work. It also has an instrumental section that justifies a general criticism of Yes that I once heard: "Their music sounds like 3 radios playing at the same time." It cant get any better..CLASSIC STUFF!!! And of course the BASS will just eat yer face..it sound's like 20 tank's..see REAL rock/metal is BASS driven..the BASS is the center to a great band in my book!! one of the best BASS player's ever!! After two comercially unsuccessful albums (which I happen to like), Peter Banks left the group and in came Steve Howe as well as a new sound for the group. The Yes Album is considered by most to be one of their best albums (Up there with "Fragile" and "Close To The Edge") and it is not hard to hear why. The Yes Album holds some their best songs, including the hit "I've Seen All Good People" and such classics as "Yours Is No Disgrace" and "Starship Trooper". Every song on this album I consider to be great. "The Clap" is a nice accoustic instrumental by Steve Howe. "A Venture" is on the short side (for a Yes song), but is still quite good. "Prepetual Change" is a really great way to close out the album. It should have gotten a lot more attention from the people because this is a great song. Could have been a major hit for the group. As for editions, well most of you are going to want to go for this version, which is the original album, remastered and with bonus tracks. If you don't want the bonus tracks, go for the 1994 remaster. If you're a collector and like to have the original versions of CD's, then there is an original version out there with the number SD 19131-2. If you want to hunt it down, then feel free, it's somewhat easy to find. This was the Progressive Seed for me!